CHECK-IN/ CHECK-OUT TIMES: Check in time is after 3:00 PM and check out is before 11:00 AM. An early check-in or late check-out is available for a fee. All properties are non-smoking. PAYMENT: Refundable Damage/ Reservation Deposit or Damage Insurance is required at the time of booking to hold the date for you. The Reservation Deposit will not be applied to the rent, and reverts to a Security Deposit upon arrival. An Advance Payment of the 1st half (50%) of the balance due upon booking and will be applied toward the rent. A final payment (remaining 50% of the balance due) is due forty-five (45) days before your arrival date. Payments can be made by: Visa, MasterCard, Discover or Personal Check, if reservation is made 45 days prior to arrival. If payment of rent is made by a check that is dishonored by the bank for any reason, the Guest agrees to pay $35.00 for each dishonored check up to the maximum allowed by state law, and subsequent rent payments, at the Pacific Breeze Properties, option, will be in a guaranteed form of payment. If payments are made with credit cards, deposits shall be refunded to the credit card. There will be a $25 surcharge for splitting payments up between guests. Pacific Breeze Properties, utilizes a credit card clearing vendor, so fees may be applicable. DEPOSIT RETURN: Deposit will be returned after inspection is made of the property, and within 14 days of departure. Charges for any damage will be deducted from deposit. The deposit is NOT applied towards rent; however, it is fully refundable within (14) days of departure, provided the following provisions are met. c. All debris, rubbish and discards are placed in trash cans, and soiled dishes are placed in the dishwasher. CANCELATIONS: Cancelations (or acceptable changes) that are made more than ninety (90) days prior to the arrival date will incur no penalty. Cancelations that are made within 45-90 days of the arrival date (or changes resulting in a shortened stay) will forfeit half the advance payment and the reservation deposit (if applicable). Cancelations within 45 days of arrival date will forfeit the full payment and the reservation deposit (if applicable). No refund of rent will be made for early departures. Reservation deposits and rent payments will be refunded if reserved dates are booked, less processing fee of $150. Travel Insurance is highly recommended. Tenant hereby assumes all risk of damage to any and all personal property of Landlord and Tenant, including household furniture and goods during such use and occupancy. Tenant hereby assumes any and all risks associated with the foregoing and agrees to hold Landlord harmless from and indemnify Landlord against the same. The property is a privately owned home and is not a Hotel. The Homeowners nor Pacific Breeze Properties LLC are not responsible for any accidents, injuries or illness that occurs to renters/guests/visitors while on the premises. The Homeowners nor Pacific Breeze Properties LLC are not responsible for the loss of personal belongings or valuables of the guest. Should you accidentally leave an item, we will do our best to reconnect it with you, at your shipping cost. The property is a privately owned home and is not a Hotel. The Homeowners nor Pacific Breeze Properties LLC are not responsible for any accidents, injuries or illness that occurs to renters/guests/visitors while on the premises. The Homeowners nor Pacific Breeze Properties are not responsible for the loss of personal belongings or valuables of the guest. Should you accidentally leave an item, we will do our best to reconnect it with you, at your shipping cost. A start up amenities package provided for our Guests includes; new kitchen sponge, dish and hand soap, a limited supply of toilet paper, paper towels, some cleaning supplies and start up laundry detergent. Any supplies beyond the initial start up amenities package provided by Pacific Breeze Properties LLC. are to be supplied by the Guest. Grocery stores are conveniently located nearby. We offer grocery services for you prior to your arrival; please inquire with a reservationist. Keys to the premises are the exclusive property of Pacific Breeze Properties. There will be a minimum charge of $50 for replacement of each lost key and a $75 charge for lost remote controls. For replacement of pool key cards there is a $100 charge. This applies to Na Hale O' Keauhou Properties only. 1) In case of emergency, without prior notice. (2) To make necessary repairs, alterations, improvements, supply necessary or agreed services. In case of repair that is not emergency related,Pacific Breeze Properties LLC will contact you for your permission to enter should you not be available at the time of repair. Repairs will wait for your permission or your departure. If a unit is for sale, you will never be asked to make your property available for show. It is Pacific Breeze Properties LLC's policy to never disturb guests. The Guest will not violate any City, State, Association, or Federal Law in or about the premises, and the Guest agrees to comply. There will be no disturbing the peace or acts creating a nuisance or loud or unusual noises or intoxication in or about the premises at any time. Pacific Breeze Properties LLC does not allow wedding parties or parties with loud music, bands, DJ's etc. Pacific Breeze Properties LLC, will not be liable for any damages or injury to the Guest, or any other person, or to any property, occurring on the premises or any part, or in common areas. The Guest agrees to hold Pacific Breeze Properties LLC harmless from any claims for damages, regardless of how caused. The subject property may have located thereon a swimming pool, Jacuzzi or have ocean front access. Swimming pools and spas are inherently dangerous, especially to young children and the infirm. The following are prohibited; diving & scuba gear, running in pool area; glass containers in pool area, or on the lava beds; any children in or around the pool or the ocean without adult supervision. 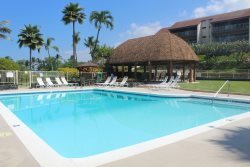 In consideration of the owner’s agreement to rent the subject property to the Guest, Guest agrees to strictly abide by the Pool and House Rules, use a standard of caution around the ocean and does further agree to indemnify, defend and hold harmless owner and Pacific Breeze Properties LLC from and against all claims, liability or loss that Guest may sustain from the use or operation of the swimming pool, Jacuzzi and the ocean by Guest and/or Guest’s invitees. In that Pacific Breeze Properties LLC, does not personally own their rental properties (they are a third party management company) Pacific Breeze Properties LLC, shall be held harmless for all claims, liability or loss that guest may be sustained from use of any of their rental properties, including but not limited to if a property should no longer be available to rent for any reason out of their control (unbeknownst foreclosure or other previously known owner controlled decisions, acts of nature, etc.). Pacific Breeze Properties LLC is diligent to have knowledge of such potential circumstances but we are not always privy to owners’ circumstances in advance of such occurrences. Should your property no longer be available you will be notified as soon as we are aware of such circumstances. Pacific Breeze Properties LLC will make a concerted effort to move your party to another property managed by Pacific Breeze Properties LLC, otherwise all rental monies will be returned to the Guest immediately. Upon termination, the Guest will: (1) completely vacate and clean the premises and any parking or storage areas used by the Guest; (2) leave keys in unit, (3) leave remote controls and garage door openers in the unit, (4) leave all furnishings in the same condition as received (do not move furniture unless medically necessary and please let us know this has been done in advance). Pacific Breeze Properties LLC, reserves the right to immediately terminate the tenancy if the Guest violates any part of this agreement and risks a minimum $250 fine. By acknowledging this agreement below you are thereby authorizing Pacific Breeze Properties LLC to include your address in our mailing lists, to inform you of special offers and opportunities. All notices, demands, or consents required or permitted under this Agreement will be in writing and will be delivered in person or by facsimile, mailed or emailed prior to stay. The service of any notice on one Guest will be deemed a service of all occupants on the premises.